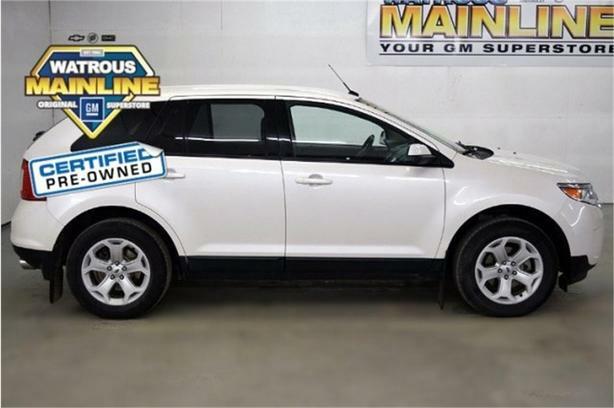 Come see this certified 2013 Ford Edge SEL. Its Automatic transmission and Gas V6 3.5L/213 engine will keep you going. This Ford Edge comes equipped with these options: Unique cloth heated front bucket seats -inc: 10-way pwr driver seat w/pwr lumbar, 4-way driver & front passenger adjustable headrests, Tire pressure monitoring system (TPMS), SYNC Basic voice activated communications & entertainment system -inc: Bluetooth capability, steering wheel audio controls, USB port, audio input jack, 911 assist, Supplemental park lamps, SOS post crash alert system, Solar tinted front windows, SecuriLock encrypted passive anti-theft system (EPATS), Safety canopy system w/rollover sensor, and Roof antenna. See it for yourself at Watrous Mainline Motor Products Ltd, 208 1st Avenue East Box 70, Watrous, SK S0K 4T0.